Edwin Chris Griggs, 61, died Thursday, January 17, 2019. Born in Bennettsville, SC, he was a son of Edwin Harrison Griggs of Wallace, SC, and the late Rose Linton Griggs and stepson of the late Grace Griggs. 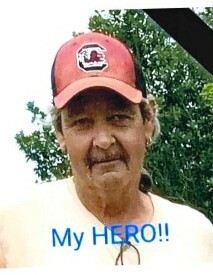 He was a race car driver during 1990s – 2000s at Florence Motor Speedway, he loved spending time with his grandchildren, and loved his family and friends and would give you the shirt off of his back if needed. Surviving is his wife Sarah Margaret Griggs, his daughters, Ginger Griggs and Chrisy (Ross) Griggs all of Wallace, SC, sisters, Tracy G. (Jimbo) Miller of Wallace, SC, Sue C. Wester of Ocean Isle, NC, Dee Gee C. (Larry) English of Rosman, NC, Charlene C. (Ronald) Lyon of Houston, TX, Judy D. (S.J.) Clark of Wallace, SC, Cheryl D. (Billy) Lovin of Hamlet, NC, sister in law, Linda Chapman of Houston, TX, grandchildren Sarah Rose (Joe), Kenny, Drew, Emma, Ryder, and Kinsely, nieces and nephews, Jimmy (Chelsea), Trace, Alicia, Chasity, Bryan (Erica), Brad (Angela), Contessa (Tommy), Charles (Lauren), Amber (Jackie), Aaron (Michelle), JoAnne (Clegie), Gene, Amy, Brandon, Timmy, Shannon (Cale), Brandy, Otis, Catoria, Frannie, Robert, John, Billy, Thomas, Brad, Henry, a great niece, Chapin, and a best friend, Frankie Quick. He was preceded in death by mother and stepmother listed above, a brother, Duncan Chapman, sister, Deanna D. Miles, and brother in law, Billy Wester. The family will receive friends 6:00 PM - 8:00 PM Sunday, January 20, 2019 at Kiser Funeral Home, Cheraw, SC. A funeral service will be held, 3:00 PM Monday, January 21, 2019 at Kiser Funeral Home, Cheraw, SC. Memorials to: St. Jude’s Children’s Research Hospital, 262 Danny Thomas Place, Memphis TN, 38105. Visit kiserfuneralhome.com to send an e-condolence.